A digital positioner is primarily intended for use with modulating control valves. 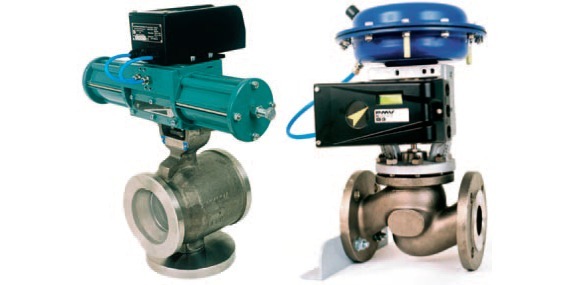 Full featured units will accommodate single or double acting actuators, as well as rotary and linear valves. A digital positioner is a precision instrument and should be treated with a commensurate amount of care to prevent damage during installation and setup. The positioner will read a control signal input, such as 4-20 mA. The internal processing of the digital positioner will regulate the operation of air supply and venting valves integral to the positioner, regulating the motive pressure on the actuator and the resulting valve trim position. Positional feedback of the valve position is provided by a potentionmeter. Units can be provided with one of several different communications options to enable setup and diagnostic information to be transmitted across a network. Good air supply quality and pressure will assure the best positioner performance. Various spindle and bracket arrangements are available to facilitate proper mounting of the digital positioner to the valve actuator. The use of a digital positioner enables superior modulating valve control and repeatability, along with improved diagnostic information. More detail is contained in the document provided below. Share your fluid control challenges with valve automation experts, combining your own process knowledge and experience with their product application expertise to develop effective solutions. PMV Digital Valve Positioner from Classic Controls, Inc.